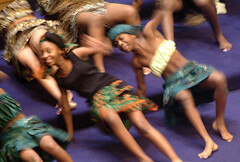 The African American Academy African Dance Troupe were a blur of motion at a Martin Luther King celebration at Mt. Zion Baptist church, 2003. Photo courtesy of the Seattle Municipal Archives. The African American Academy (AAA) on South Beacon Hill will hold a Juneteenth celebration on June 19 focusing on the life, purpose, and accomplishments of the Academy. The AAA program has been discontinued and the Van Asselt Elementary program will be housed in the AAA building next school year, after a century at their previous site. The Academy program first opened as a K-5 school in 1991 at the new Colman School (now Thurgood Marshall) and eventually became a K-8 at Sharples (now Aki Kurose). The current AAA building was specifically designed for K-8 use and opened in 2000. The Juneteenth event, “Celebrating the Life of the Academy”, is on Friday, June 19 from 4:00 – 7:00 p.m. at the African American Academy, 8311 Beacon Avenue South. As we mentioned in an earlier post, Van Asselt is also celebrating their history this month, with a 100th Anniversary celebration and reunion this Friday. June 19th is a Saturday. Your posting has Friday. So which day is it, Friday or Saturday? This post was from 2009, when it was on Friday. The African-American Academy closed last year.